We have shared many bullet time tutorials over the years, from high end, through crowd sourced to pinhole driven. This time I am happy to share a build made solely on Raspberry Pi and the Raspberry Pi camera module. The folks at PiFace, a company that wants kids to program again, came up with this insane 48 Raspberry Pis bullet time rig. The rig is made of said Pis and a custom made laser-cut circle. 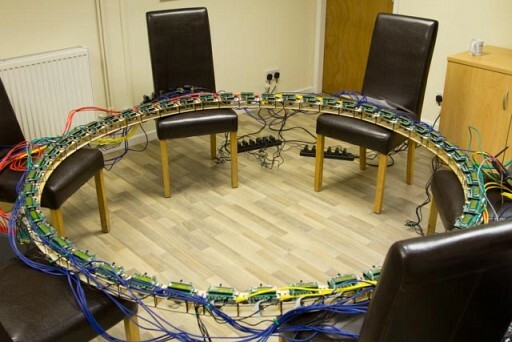 The final construction, aside the Pis is made of 48 SD cards, 48 5V power supply units and about half a kilometer of network cables. While it’s a cool experiment in learning how to program, etc, there is $3,500 in just boards and camera modules there, plus ancillaries, and the final video quality is pretty poor.